There is a big unnecessary stone (rock) in the levee of rice field. The material of the rock is granite often used for the tombstone and the stone monument, etc.It was the state as it is up to now though thought that you should have taken it because this stone was at the position that just became obstructive when cultivating it with the tractor for years. This time, because the stone was divided by using this because the special wedge [named in Japanese SERIYA] was obtained, I introduce it. This is the stone. The part not seen is very large. 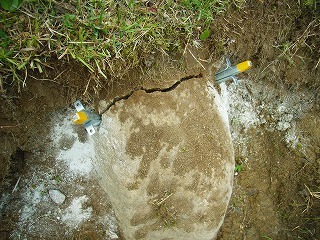 This stone is at the position that becomes obstructive when just cultivating it with the tractor. 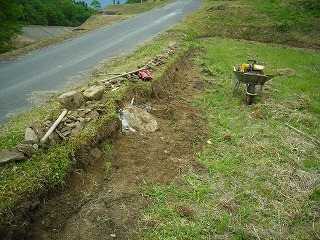 It was not possible to use it while just lending the backhoe this time though it usually removed with the backhoe. First of all, because the stone is punctured in the hammer drill in the place that the commercial power source cannot use, the dynamo is prepared. The dynamo uses the model of 100V about 600W or more according to the drill. Because power was necessary, the frequency was set to 60Hz and used. It is necessary to prevent garbage from entering eyes to pierce with a drill, to use the hammer, and to process the stone by drill steel. I think that I should use safety glasses of usual glasses though it is better. The drill is TE-22 of [HILTI] (about 600W), and the blade is concrete bit Φ26mm for [HILTI]. 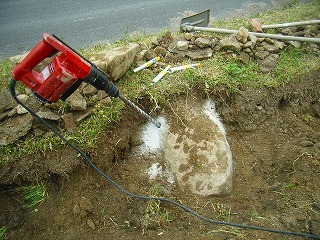 A concrete bit for [HILTI] can also puncture the stone. The size of a concrete bit is matched to the size of the special wedge. Making to 3 pieces can beat the special wedge and crowded power be a little though two holes were made according to the size of the stone this time. It shoaled and it made it to about 10cm because the stone was not so large this time though you should make the depth of the made hole more than the size of the special wedge. The special wedge of Φ26mm only for stone remunerative was obtained and used this time. The direction of the special wedge is set to become direction where it wants to divide the stone. Three pieces are a couples. When the special wedge is sequentially driven with the hammer little by little. 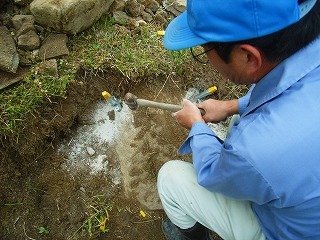 Because this was not a too big stone, two special wedges were used. When the stone grows, the number of special wedges is increased. If the number of special wedges is increased, it is the one that cracks well even if the direction of the grain of a stone is not so thought. Because the weight of the rock is large even if the rock cracks, it quite pulls and it is not possible to peel off. Because the width of the fid is about 2-3cm, the space is not extensible any more only by the fid. A small stone was packed in the space of the rock and the space was expanded little by little after all. When the space was expanded by bar of big iron, the stone was packed. It decided to use it as a stone wall without throwing it away because it was a stone divided with great pains.